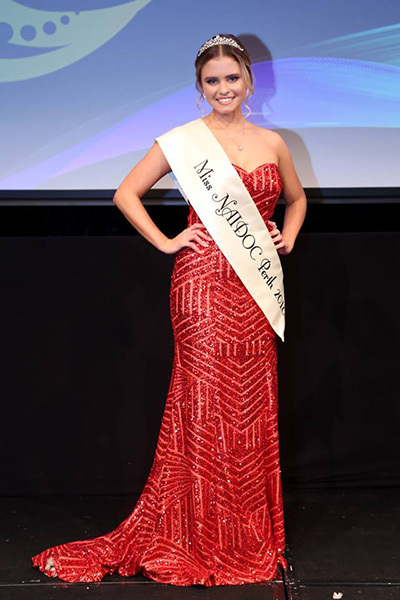 WA law student Sophie Coffin from Port Hedland in the state’s north west, says she’ll use her 2018 Miss NAIDOC crown as a platform to motivate other young indigenous women and to advocate for Aboriginal rights. The Ngangumarta Yindjibarndi woman was one of nine finalists to take part in the six-week leadership and empowerment program for young Aboriginal and Torres Strait Islander women which culminated in a gala event at Perth’s Crown Ballroom recently. “I was really surprised and shocked, I didn’t think it would be me – there were so many beautiful and strong Aboriginal women in the group,” she says. It goes to show you can come from anywhere and conquer the city, something I never thought possible. Making her win all the sweeter was a large contingent of family and supporters who travelled from Broome, Hedland and Geraldton to cheer her on says Sophie, who was encouraged to enter the competition by last year’s winner Kearah Ronan. She wears it well. 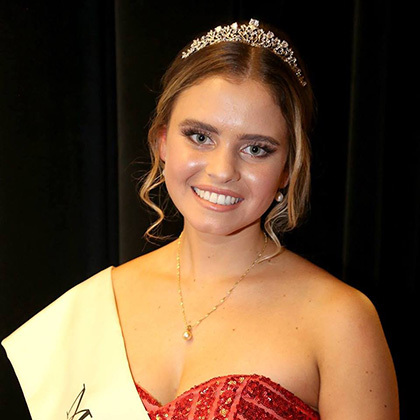 Sophie Coffin was acknowledged for her strong leadership qualities as she was crowned Miss NAIDOC 2018. The 22-year-old, who is studying her Juris Doctor at UWA after completing a Bachelor of Arts in Law and Indigenous Studies last year, is passionate about using her new found platform to address issues such as discrimination and racism which she says can often take a very discreet form. “These things are not always overt but they still exist, even if it just comes down to body language and the way people interact,” she says. “I’d like to educate people about what it is to be an Aboriginal person today. I guess that’s why I chose to study law because of my passion for Aboriginal rights. I felt if I knew the law and how to work with it and translate it, it would be a practical way for me to advocate for change. No stranger to speaking out Sophie represented UWA at the 7th International Scholars Leadership Symposium in Vietnam in 2016. Last year she was a presenter at the World Indigenous People’s Conference on Education in Toronto and also took part in the International Visitor Leadership Program: Indigenous Leadership Exchange in the USA. A keen horse-rider who enjoys water polo and swimming in the summer months, she plans to return to Port Hedland - known by the Indigenous name of Marapikurrinya meaning ‘place of good water’ - when she has completed her studies, to give back to her community. She pays particular tribute to her parents, saying the example they set is what helps her to succeed and says she’s also grateful for the "huge support" she has received from the School of Indigenous Studies and Shenton House at UWA. “They have become my home away from home, there is so much support for us country kids and I love it, we are a community here at UWA,” she says. Picture at top of page: UWA's historic and heritage-listed Shenton House, home to UWA's School of Indigenous Studies.